SUBHEAD: For indigenous people, the fight to halt the Dakota Access Pipeline is about reviving a way of life. Image above: Kandi Mossett on a hill overlooking the Oceti Sakowin Camp. Photo by Sarah Jaffe. From original article. The first sign that not everything is normal as you drive down Highway 1806 toward the Standing Rock reservation in North Dakota is a checkpoint manned by camouflage-clad National Guard troops. The inspection on Sept. 13 was perfunctory; they simply asked if we knew “what was going on down the road” and then waved us through, even though the car we rode in had “#NoDAPL” chalked on its rear windshield. “What is going on down the road” is a massive camp-in led by the Standing Rock nation, aimed at blocking the construction of the Dakota Access Pipeline (the DAPL in question), which would carry oil from the Bakken shale in North Dakota across several states and under the Missouri River. What began with a small beachhead last April on the banks of the Cannonball River on land belonging to LaDonna Brave Bull Allard has expanded to both banks of the river and up the road, to multiple camps that have housed as many as 7,000 people from all over the world. Because of them, first the Obama administration and then a federal court stepped in to temporarily halt construction of the pipeline near the campsite. Still, the people of Standing Rock and their thousands of supporters aren’t declaring victory and folding their tents just yet. The legal struggles for a permanent shutdown of the pipeline construction continue: the people of Standing Rock have filed a lawsuit to halt construction, as has one of the South Dakota Native American nations and landowners in Iowa as well. As the lawsuits proceed, other members of the camp have been involved in nonviolent direct actions, locking their arms around construction machinery to prevent digging. Dozens have been arrested as part of those actions, including 22 people on Sept. 12, the day I arrived at the camp. That was days after the Obama administration’s call for a temporary halt to construction on the pipeline, and a stark reminder that the struggle was not over. In addition to the legal battles and the direct actions, though, the people of the Oceti Sakowin and Sacred Stone camps were preparing for another challenge: a North Dakota winter. Already at night, the temperature drops to 40 degrees Fahrenheit; deliveries of blankets and warm clothing were constant, as was the chopping of wood for fires and discussion of what kinds of structures would allow the camps to stay in place through the bitter cold months ahead. We’re already winterizing in all aspects of the camp, young people working with the elders to find, whether it’s longhouses, whether it’s yurts, whether it’s any kind of structures that would keep us warm for the winter,” said Lay Ha, who traveled to North Dakota from the Wind River Reservation in Wyoming in late August and became part of the camp’s youth council. They’re staying partly out of suspicion: A temporary halt is, of course, just temporary. “As far as I can see, it’s just another way to lull us to sleep, make us go to sleep so we leave and then they’ll start again,” said Ista Hmi, an elder from Wanblee, South Dakota on the Pine Ridge Reservation and a member of the Seven Council Fires. “We’re protecting the water, we’re not protesters,” explained Lay Ha. To him, as to many others in the camp, that the action is led by Native people, that it is built around their belief in nonviolence and in the spirit of prayer, is vital. It is, to them, much more than a protest. Ha is Arapaho and Lakota on his father’s side and Eastern Shoshone on his mother’s; he is part of what has become the largest coming together of Native people in, many said, more than 100 years. The flags that flap overhead represent something more than a fight for clean water — they are a powerful statement of solidarity, a declaration of common interest. Then emerges the breathtaking sight of what is now called the Oceti Sakowin camp: Flags from well over 200 Native nations and international supporters line the driveway into the camp, flapping in the high plains wind. People ride through the camp on horseback. Kandi Mossett of the Indigenous Environmental Network was wearing a “No Fracking” T-shirt when I met her at the media tent, doing an interview alongside a delegation from Ecuador of indigenous people who have also fought the oil companies there. She is from northwestern North Dakota, the Fort Berthold reservation, and the oil that would travel through the Dakota Access Pipeline is extracted from her community. She came to Standing Rock for the formation of the original camp, known as the Sacred Stone camp, on LaDonna Allard’s land. At first, she remembered, the camp had anywhere from five to 30 people. Then, when Energy Transfer Partners, the company behind the pipeline, put out notification that it was going to begin construction, the camp swelled to 200, then 700. It spilled over the river, into what was at first simply called the overflow camp. But as that camp grew, the campers began to feel it deserved its own name. Oceti Sakowin is the name for the Seven Council Fires, the political structure of what is known as the Great Sioux Nation. “We had for the first time in 200 years or more, the Seven Council Fires of the Great Sioux Nation coming together in one place to meet again,” Mossett said. Faith Spotted Eagle is also part of the Seven Council Fires, from the Ihanktonwan or Yankton band. She too was there on what she remembered as a wintry, blowing day in April when the Sacred Stone camp first opened. An elder and grandmother, she had also been part of the successful fight against the Keystone XL Pipeline, and pointed out that the networks activated by that fight were coming together again in North Dakota. In 2013, she said, a dream of her grandmother sent her to look at the 1863 treaty between her people and the Pawnee. On the 150th anniversary of that treaty, Jan. 25, 2013, those nations, along with the Oglala and Ponca, signed the International Treaty to Protect the Sacred from Tar Sands Projects. “In that treaty, we declared that forevermore we would be allies to stop this extractive move to destroy Mother Earth from the Boreal forest down to the Gulf,” she said. Since that time, other nations have joined, and the treaty was renewed with prayers and a donation to the Sacred Stone camp. To Dave Archambault II, the tribal chairman of the Standing Rock Sioux, the struggle — and the response from indigenous people — is global. He greeted reporters Sept. 14 alongside the delegation from Ecuador. Some of the campers were planning trips back and forth, while others were committed to staying. The nature of the camp has been to swell and shrink; on the weekends, Kandi Mossett said, it grows exponentially. For those who can’t make it to the camp, Mossett noted, there are other ways that supporters have held actions in solidarity with the camps. “We are targeting the financers of this project: the banks,” she said. There are petitions, Facebook pages for the Sacred Stone and Red Warrior camps, and a call for Barack Obama to visit the camp. “We will welcome you, we will greet you, we will feed you, we will put up a tepee for you,” Mossett said. The long-term strategy, she said, is similar to that of the Keystone XL project. “They told us ‘You are crazy. It is a done deal.’ They told us that about the Keystone XL and they are telling us that now about Dakota Access, that it is a done deal. The sentiments of Mossett and Spotted Eagle underscore what is perhaps most significant about the camps along the Cannonball River: What is happening here is something more than just a fight to stop a pipeline. In the speak-outs and prayer circles, speaker after speaker, from the Pacific Northwest and from the Amazon, from New York to Arizona recalled the historic violence committed against Native American people not far from where the camp stood. Many recalled the Battle of the Greasy Grass, what is taught to schoolchildren as the Battle of Little Bighorn, which LaDonna Allard wrote was the last time the Oceti Sakowin came together. But for her and others, the massacres at Wounded Knee and Whitestone were closer to mind. It was the anniversary of the Whitestone massacre, where 250 women and children were killed by the US military, when private security guards turned dogs on the protesters at Standing Rock. It was Faith Spotted Eagle’s people, the Ihanktonwan, along with the Hunkpapa, that were killed there, and the use of police and security against peaceful protesters brought up those memories. The echoes of historic struggles were everywhere, and to Spotted Eagle, they were reminders that the fight for the water is just a part of the fight for an entire way of life that was nearly crushed. She was raised speaking Dakota, and counted herself lucky to have her language and the worldview that came with it. 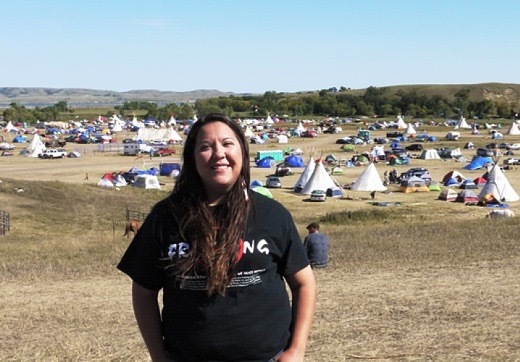 The grass-roots organizing that brought together the camp, she said, was helping the Standing Rock people and other tribal governments to look past the structures imposed on them by the process of colonization. Walking around the camp, you pass singing circles and the kitchen — Tuesday night the menu was moose, brought all the way from Maine by a visitor to the camp. A nurse from the medic tent made rounds, making sure that people knew that at night, the Standing Rock ambulance parked on the grounds would leave but the medics would be on duty. Young children played volleyball and posed for photographs, finished from their day at school — a fully recognized school that teaches both the core curriculum so children at the camp won’t fall behind their schools at home, and also teaches songs and dances, languages and history, about the treaties and the fight for the water. At night, campfires burned and tepees glowed, lit from within, as the open mic for speak-outs gave way to singing and dancing. “We have had a few growing pains, but that is to be expected when you go from 30 people to 1,000 people in two or three days,” Mossett said. “There are a lot of logistics behind the scenes, things that people don’t see. Where are people going to go to the bathroom? Bringing in porta potties. The coming together of the nations was something Mossett wanted for as long as she could remember, and that more than anything helped her envision a victory, not just against the Dakota Access Pipeline, not just against the whole extractive industry but for something much bigger. • Sarah Jaffe is a reporting fellow at The Nation Institute and the co-host of Dissent magazine's Belabored podcast. Her book, Necessary Trouble: America's New Radicals, is due out from Nation Books in August 2016. Follow her on Twitter: @sarahljaffe.